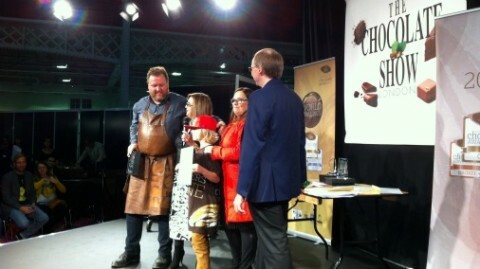 What with Chocolate Week, The World Finals of The International Chocolate Awards and The Chocolate Show, last week was pretty key in the world of chocolate! Last week was Chocolate Week. Up and down the country folks were coming over all chocolatey! There were special afternoon teas, pairings, offers and treats galore. It is a glorious annual festival to my favourite foodstuff. 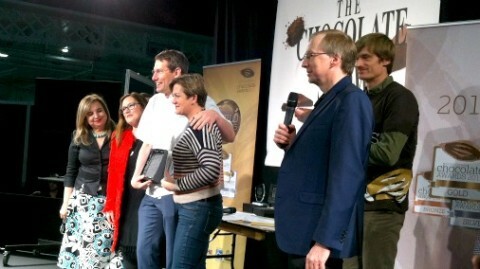 My Chocolate Week was dominated by judging the World Finals of The International Chocolate Awards. Our biggest ever competition, the finals had over 400 entries, all of whom had qualified by being medal winners at one of the 9 heats that have been held during 2015 around the world. It has been a massive and delicious undertaking. 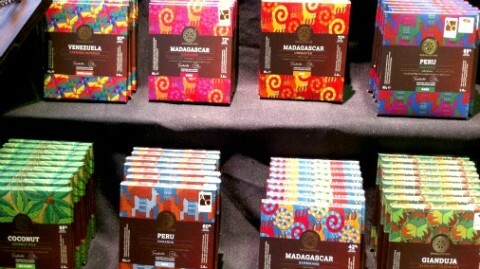 And it is hugely exciting to see fine chocolate reaching new heights across the globe. 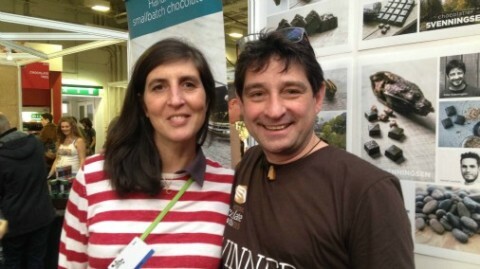 The week culminated in The Chocolate Show, a three day immersion in all things fine chocolate, which saw more than 15,000 people make their way to National Hall at Olympia in Kensington. It was a chance to see old friends and meet new ones, edible and otherwise, from all around the world. What a tasty time was had! Chocolate sculptures at The Chocolate Show. 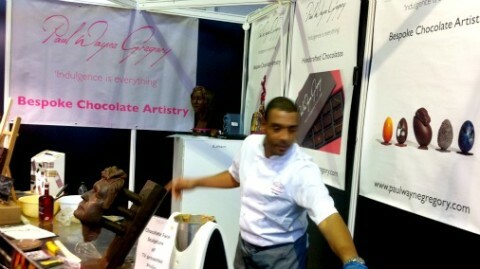 As well as being delicious, The Chocolate Show is just that, a show, a spectacle. There is a daily fashion show of chocolate dresses designed by some of the most creative in the business, and a display of chocolate sculpture. 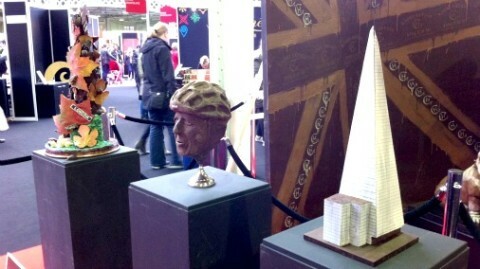 Above are pieces by; from the left, Paul A Young’s autumnal London, Aneesh Popat’s Boris Johnson, and Barry Johnson’s shard. Edd Kimber and Will Torrent take to the stage. The main stage was as busy as always. 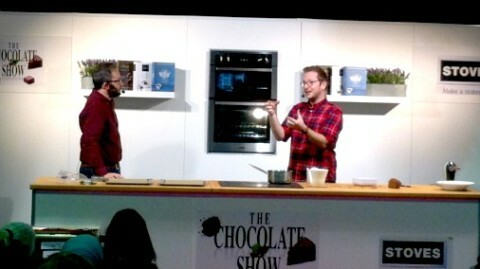 Here Edd Kimber was talking ganache with host Will Torrent, both men who know a little bit about chocolate! Boys on film, Willie Harcourt Cooze holds forth. And the spectacle was being broadcast beyond the venue. 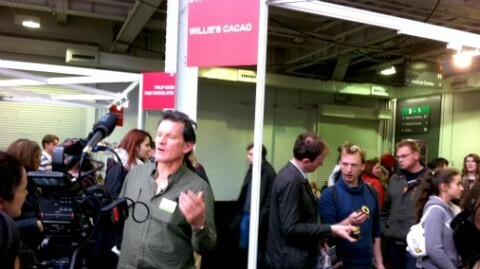 Film cameras abounded, here interviewing the Willie’s Cacao founder. Paul A Young in front of the cameras. 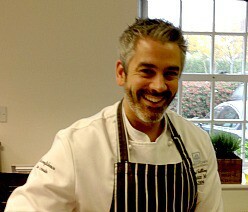 Paul A Young, always a joy to watch, was here being filmed making his famous brownies. Paul had taken the fabulous decision to have an on site oven and was cooking up batches of various types of brownie for sale oven fresh. Rightly celebrated, the salted caramel being piped onto this batch is in a class of its own. 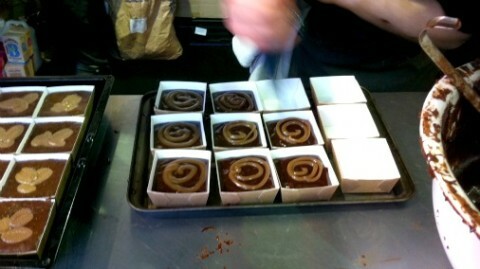 Two brownies ready to go, salted caramel on the left, classic on the right, both impossibly scrumptious! Good call Paul! Paul Wayne Gregory in action. Chocolate sculpture has been a passion of Paul Wayne Gregory for many years, and at the Chocolate Show he was demonstrating techniques, as well as selling his well flavoured filled chocolates. 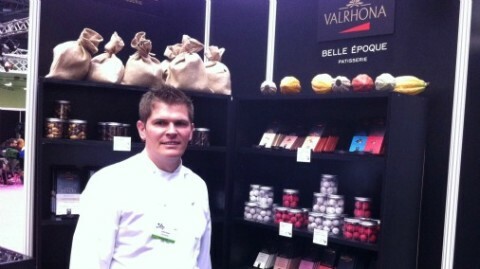 Valrhona is the chocolate of choice for many chefs, due to their extensive selection of couvertures. 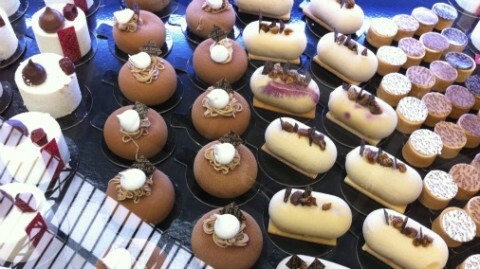 Luke Frost in now in-house at Valrhona, showing how to do chocolate patisserie. Belle Epoque patisserie for Valrhona. For The Chocolate Show Valrhona had teamed up with fine French patisserie Belle Epoque, to share recipes that brilliantly showcase the chocolates in Valrhona’s collection. It is exciting to see how many new talents there are working in Britain. I caught up with Matthieu de Gottal, based in the Cotswolds, whose way with whisky is a particular strength. And Chris Attwell of The Winchester Cocoa Company, who has hit the ground running with precise and full flavoured ingredient pairings. Both of these boys are worth watching, and I’ll be writing more about their work going forward. Colourful bars from The Chocolate Tree. The UK bean to bar scene is alive and well and growing in front of my eyes. The Chocolate Tree in Edinburgh are hitting their stride, their bars are absolutely worth sampling. New kid on the block, Damson in North London. 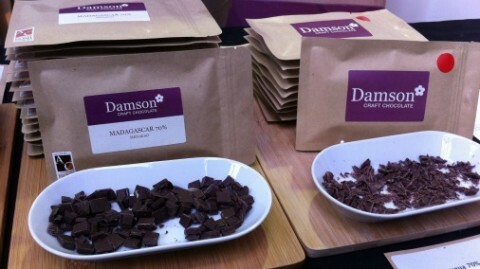 New bean to bar in London, with a shop premises just opened (by appointment), is Damson Craft Chocolate. 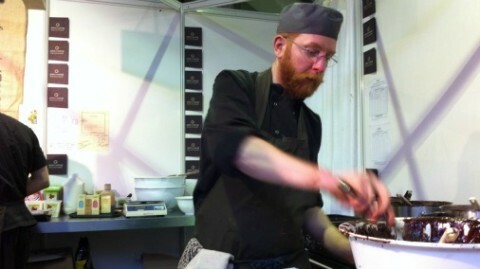 Dom Ramsey has put his ten years experience as a chocolate blogger into creating his own. His personal favourite is currently his dark milk Trinidad with buffalo milk. The intense creaminess of the buffalo milk delivers a dairy hit, even at 60% cocoa mass. Bean to bar in Manchester, Dormouse Chocolates. 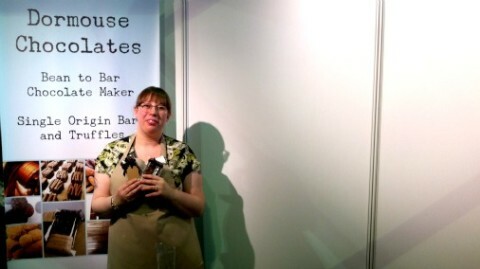 The only bean to bar in Manchester, Dormouse Chocolates is the creation of chocolatier Isobel Carse. With interesting and well made plain origins and delicious flavours such as Ecuadorian Dark with Rose and Raspberry and Papousie Milk with Chai Masala, Manchester is lucky to have her. But The Chocolate Show, and the International Chocolate Awards are wonderful world events, and it is a unique chance to discover and celebrate the world scene as well as that here in the UK. Peerless nuts and nut products. Pariani, the exceptional gourmet nut company, are sponsors of The International Chocolate Awards. 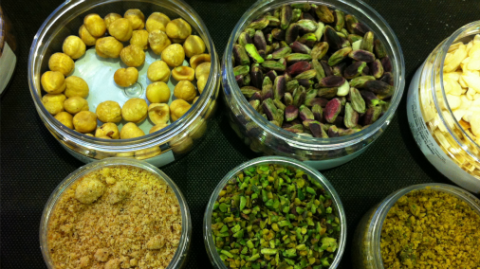 Nuts are a vital ingredient in most pastry kitchens, so the partnership is a natural one. 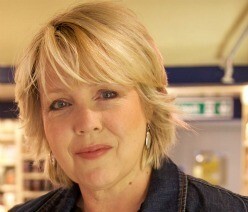 I simply cannot resist their products, straight, or as finest quality ingredients. The newest delicacy I tried is a fine syrup made from an unusual Italian citrus, it was quite stunning, with a nostalgia inducing marmalade flavour. Rococo Chocolates, part of the World Winners zone. The opportunity to taste such exceptional treats as the awards winners comes in various forms. 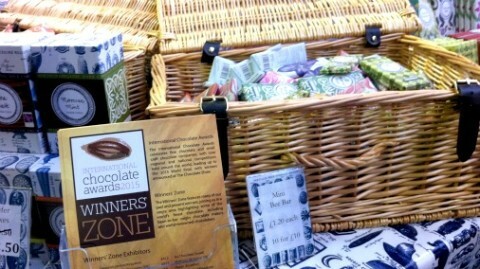 First and foremost, there was a new International Chocolate Awards Winners Zone. Which meant that for the 3 day duration you could head towards, sample, and usually chat to the makers of some of the finest things in the world. 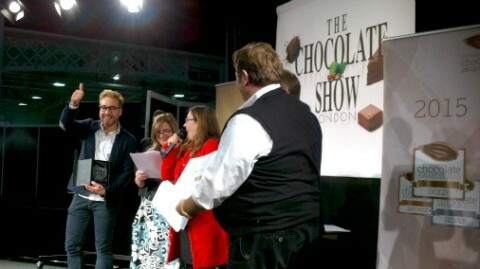 Then, after the World Finals awards were announced on Saturday evening, Sunday saw tastings of many of the world winners hosted by The International Chocolate Awards. Chocolate Naive from Lithuania, a bean to bar maker who won awards in the Eastern European competition, were there with innovative flavours such as porcini. Meeting up with Peter Svenningsen from Copenhagen. From Denmark, one of the most thrilling new chocolatiers in the world, Peter Svenningsen won many awards in the regionals and then went on to win two silver and a bronze on the world stage. His water ganaches, using fellow award-winner and Dane Friis Holm’s superb chocolate and natural home made flavours, are pure, refined, and truly exciting. 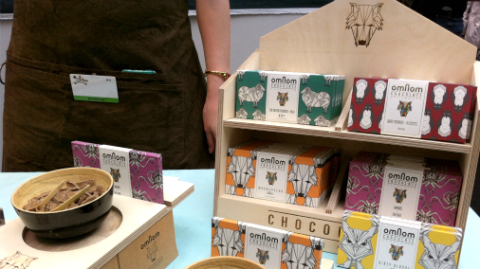 Gorgeous packaging, even more gorgeous chocolate, Omnom from Iceland. The recipient of three world silver awards, Omnom is exactly what it says on the label, yummy! 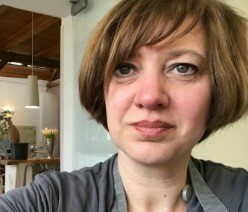 Multi-award winner, Claudio Pistocchi of TortePistocchi, Firenze. Claudio Pistocchi runs his kitchens in Florence with great passion and attention to detail. 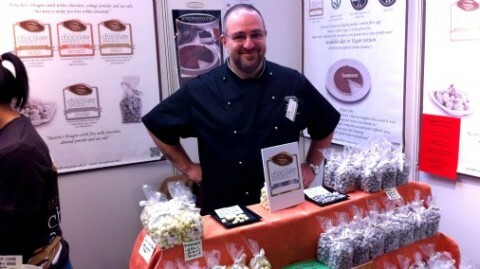 His white chocolate covered pistachios with sea salt and a touch of orange have long been a favourite of mine. They are the definition of moreish. This year they won a world silver award! 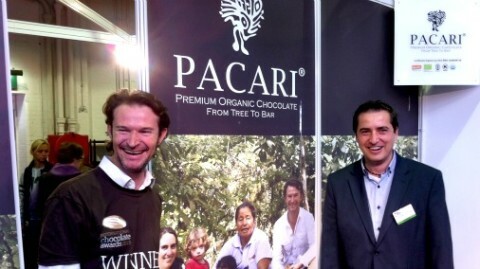 Santiago Peralta of Pacari, Ecuador, and his UK distributor Juan Andres Santelices. Pacari from Ecuador consistently top the leader boards in the Americas competition, and win multiple world awards for their clean, true-to-bean chocolates produced in the growing country. This year their tally of world awards is seven, two of which are gold. Impressive indeed. Lots to smile about Santiago. Chantal Coady, founder of Rococo chocolates and her Principle Chocolatier Barry Johnson collect one of many awards! The awards ceremony has become much like the Oscars of the chocolate world, and there were makers from across the globe. Founding partners of the awards Martin Christy, Monica Meschini and Maricel Presilla did the honours. Tears were shed, trophies were clutched, backs were slapped aplenty. Rococo from the UK are consistently world class. Gestalt from Croatia collecting their gold award. And we saw fine Italian things from a company in Croatia! Mikkel Friis Holm makes it a family affair and celebrates multiple awards. Mikkel Friis Holm, whose European dominance for his plain dark and plain milk bars was exceptional (see the lead photo of this feature), went on to win big at world level too. He scooped five silver awards and one gold. It was lovely to see Mikkel and his wife Anna with one of their kids there to enjoy the moment of triumph. 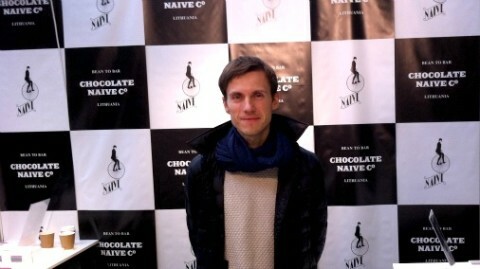 Mikkel has been working with expert French chocolate-maker Bonnat for many years. But the drive to work his own machines has resulted in his setting up his own workshops. I was lucky enough to taste the first samples of what may well be next year’s awards entries. This year has been stellar, next year just might be stratospheric! Stunning Mikkel. 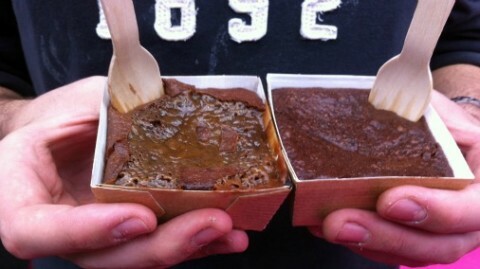 With Chocolate Week over for 2015 all that remains is to ensure it is in next year’s diary. 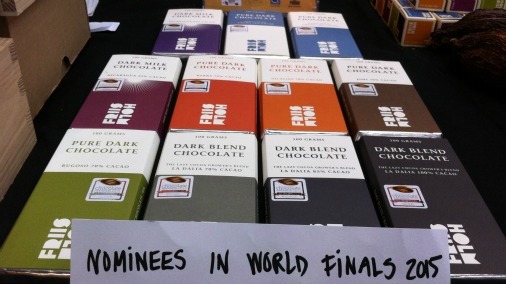 And to check out the list of the International Chocolate Awards winners, so you can plan yourself a tasting!